Experts say to never touch a yellow-bellied snake if found. A dangerously venomous yellow-bellied snake, only documented to have washed ashore in California twice before, was found dead in Huntington Beach Dec. 12, according to the Surfrider Foundation. As 275 volunteers were cleaning up Bolsa Chica State Beach, a volunteer picked it up and took it home in a zip lock bag to store it in the refrigerator while his son researched what species it was. "No one really knew when we picked it up that it was venomous," Tony Soriano of the Huntington Beach Surfrider Foundation said. 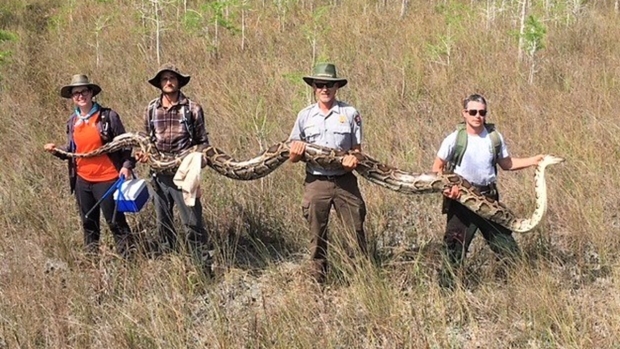 The Museum of Natural History contacted the man and picked up the snake the following Friday. Experts encouraged anyone who finds the highly venomous snake to report it. They also said not to touch it. The yellow-bellied sea snake, also known as Pelamis platura, is typically found in warmer waters in the Pacific and Indian Oceans, and can swim backward and forward. They can also stay underwater for three hours. Experts from the Surfrider Foundation said the snake likely came to Bolsa Chica State Beach due to El Niño. "There is belief that the El Niño temperature change could have enticed the creature to swim north in search of small fish and eels, which they use their venom to paralyze," according to the Huntington Beach Surfrider Foundation's Facebook post. The snakes are more likely to attack if touched, the foundation said. It was the third time documented that the "dangerous" snake was found in California. 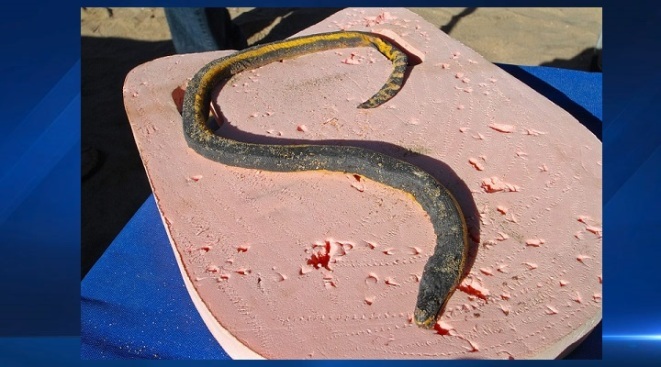 Yellow-bellied snakes were found off Silver Strand Beach in Oxnard in October. The first was found Thanksgiving 1972 at San Clemente Beach, according to the Surfrider Foundation, though Heal the Bay said the first was found in the 1980s. The snakes are looking for fresh water to drink from recent rainfall, Heal the Bay said.